Origin and Habitat: Ranges over much of northeast and central Mexico. Echinocactus ingens var. saltillensis (hort.) K.Schum. Echinocactus saltillensis hort. non Poselg. Echinocactus platyacanthus f. cristata hort. 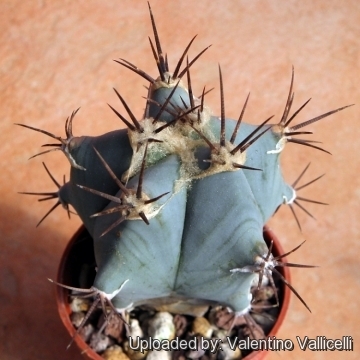 Echinocactus ingens f. viznaga (Hook.) Voss in Vilm. 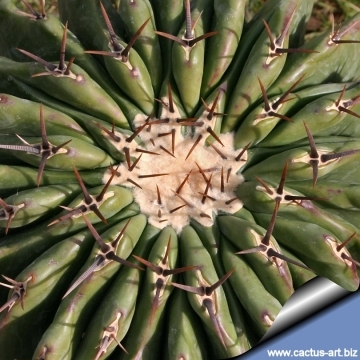 Description: It is a slowly growing massive barrel cactus usually solitary that grows huge in habitat ( up to 2,5 m tall, 1,5 m wide). It could live more than a hundred years. 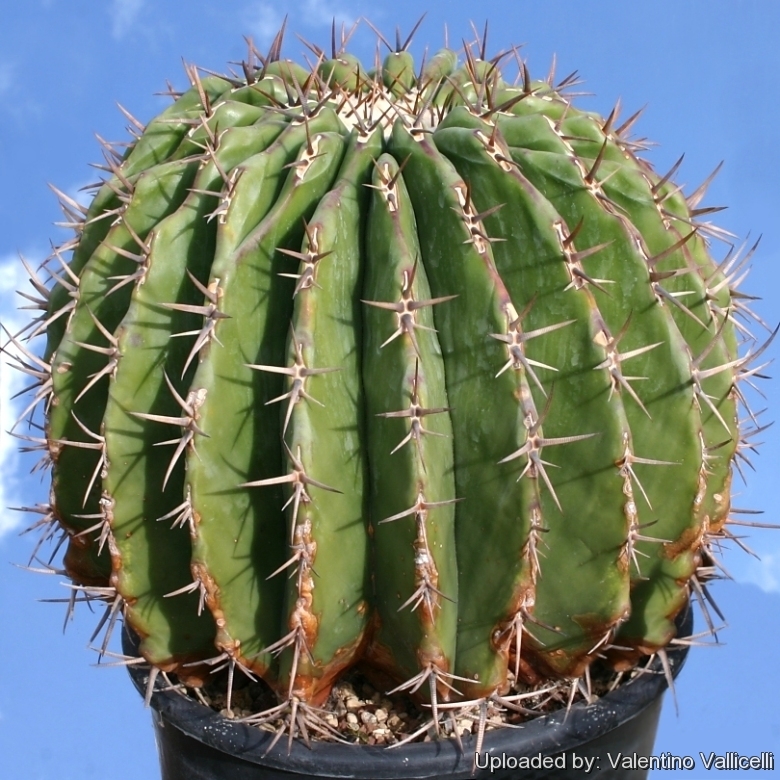 This cactus is easily recognized by it's large size, being the largest of all barrel cacti. Stem: Globular to cylindrical, , slightly flattened at the apex, grey-blue to yellowish-green often with reddish accents. The center of the apex is covered with yellowish felt. Ribs: 6 to 48, The surface is broken into obtuse, tuberculate and nice ribs when small, whilst large plants are heavily ribbed., the number of ribs increases with maturity. Areoles: 2,5-3 cm apart, elliptical covered with yellow felt, the areoles in old specimen are sunken beneath a ridge of felt running down the ribs forming a continuous line. 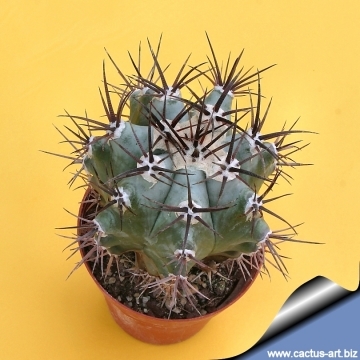 Spines: All straight, thick, rigid, about 2,5-3 cm long, black, brown or grey with brown tips. Flowers: Diurnal, tubular, about 2 cm long, 3 cm broad, vivid yellow. Inner perianth segments, linear-oblong, yellow entire, obtuse. Stigma lobes brick red, about 8. Blooming season: From end of spring to summer only on larger mature specimens receiving enough full sun. Mature specimens often have a somewhat sway-backed, saddle-shaped apex, densely covered in white wool, where their flowers emerge. Fruits: Ovoid 3 cm long, copiously covered by wool coming from the axil of the scales. Seeds: Large, black, shining, reniform. Echinocactus platyacanthus Link & Otto: This is the largest of all barrel cacti, it is grey-blue and nice when small, but areoles merge and forms a continuous line when it became large. Echinocactus platyacanthus f. cristata hort. : crested form. Echinocactus platyacanthus f. grandis (Rose) Bravo: This is one of the very large species of Echinocactus and is very characteristic of the deserts of Puebla where it is often the conspicuous plant of the landscape. Notes: Older specimens take on an oblong shape with age and can dominate a landscape because of their large size and impressive bulk. 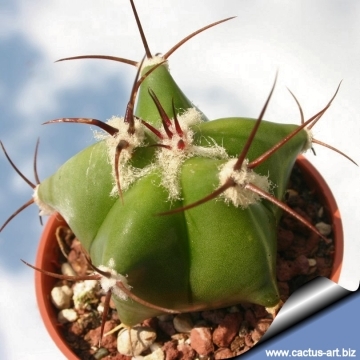 They also tend to lean to the south or southwest so that the spines can better protect the body of the plant from the harsh desert sun. In fact, desert travelers can use the plant as a compass. Cultivation and Propagation: Frost tender but resistant to -4°C for short periods; Cold hardiness increases with improved drainage, so keep plants as dry as possible in winter. They grow best in well-drained soil and a position in full sun, which will help to maintain the lustre of the spines and longevity of the flowers. Provide the plant with extremely well-drained soils, as the plant are subject to crown and soft rot if it remains too moist. Besides, it performs wonderfully in containers, Container media should be coarse as well. Young plants are prone to mealy bug and red spider mite. Propagate from seed. Uses: This plants is used to prepare a traditional candy, the pith is boiled with sugar to produce a popular sweet called “dulce de biznaga” or "acitrón". 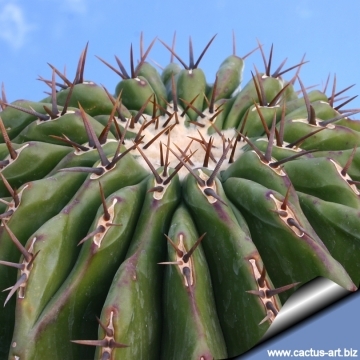 In this case the overcollection of wild plant for making cactus candy is the major threat to the survival of this species. This plants were also used by indigenous peoples of Mexico in many manner, for example the woolly hairs this plant produces have been used as filling fibres and weaving.